Select brands excel in quality and detailed production, while remaining classically elegant and distinct in design. Included are names such as Akris and, new to Santa Fe Dry Goods, Arjé. The two uniquely embody clean and modern luxury. While Akris keeps a tailored and intellectual style, Arjé is shifting the idea of luxury with a timeless, modern comfort. The Akris geometric suede jacket with a sheer base allows for the Arjé silk bone white top show through. 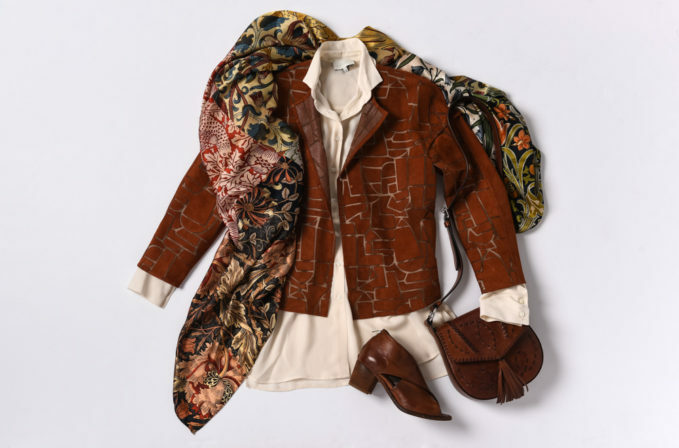 Accessorize with the Benny Setti silk multi-print scarf, Alberta Ferretti brown leather saddle bag, and Officine Creative brown leather heeled sandal—all of which showcase refined Italian craftsmanship.